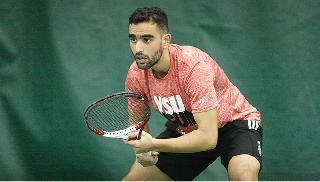 Columbus, Ohio - A pair of Youngstown State men's tennis duos advanced with first-round wins at the ITA Midwest Regionals which were held over the weekend at Ohio State. Winning doubles matches in the main draw were Matthew Kritzinger and Luke Purser and Yossi Dahan and Joao Garretto. Kritzinger and Purser beat Illinois State's Urh Krajnc Domiter and Andreas Boers 8-7 while Dahan and Garretto beat Ohio State's Hugo Di Feo and Matt Mendez by an 8-4 score. In singles play, Thomas Rodrigues won a qualifying match over Notre Dame's Conor Somers in straight sets at 6-3, 6-3. He dropped his second match 7-5, 6-1 to Jannik Opitz of Western Michigan. In the main draw, Mitch Maroscher dropped his first round match to Michigan's Myles Schalet, 6-4, 6-4. YSU is next in action at the Cleveland State Invitational on Nov. 4-6.